And you thought dealing with your boss was tough. Young Chihiro is moving to a new town with her parents. Just before they arrive at their destination, they take a wrong turn and arrive at an apparently abandoned amusement park. Little do they realize that they stumbled upon a bathhouse meant for gods. The owner of this bathhouse, the vile witch Yubaba, transforms Chihiro’s parents into pigs and strips most of Chihiro’s name from her, leaving only the kanji for “Sen,” and forces her to work at the bathhouse. It is up to Sen to free herself as well as her parents from Yubaba, but will she be able to muster the courage to do so? Spirited Away (千と千尋の神隠し, Sen to Chihiro no Kamikakushi, The Spiriting Away of Sen and Chihiro) is an anime film produced by Studio Ghibli under the direction of Miyazaki Hayao. It also was the winner of the 2003 Academy Award for Best Animated Feature Film. First and foremost, Spirited Away is a children’s anime film. For that reason, the primary focus of the movie is Chihiro’s (or Sen’s) growth. As a girl who is only about eight years old, she actually goes through the entire Hero’s Journey outlined by Joseph Campbell. That said, Spirited Away is a roller-coaster ride of a movie. Keeping with tradition, Miyazaki created an extremely imaginative world in this bathhouse that is staffed mostly by frogs and slugs. Of course, that doesn’t even begin to describe the different kinds of creatures Chihiro meets in her tenure in Yubaba’s employ. Spirited Away also demonstrates how it is impossible to talk about a Ghibli picture without mentioning the absolutely gorgeous animation. The movie is full of bright and beautiful artwork. When things get moving, you can see that the animators had a pretty ridiculous amount of attention to detail. Character movements meshed perfectly with the backgrounds. 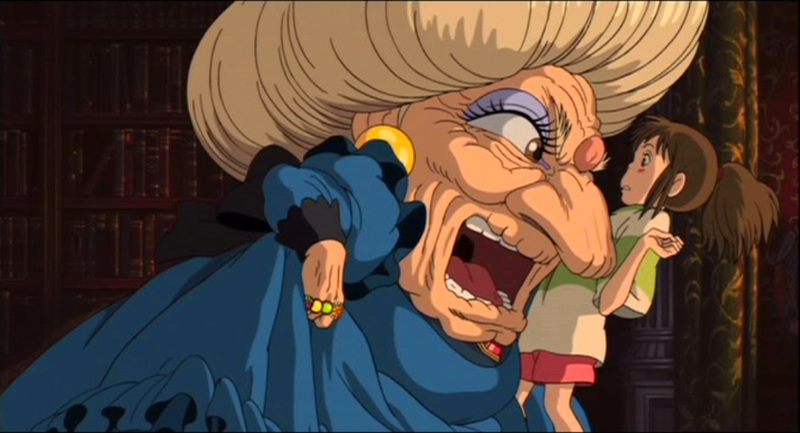 The folks at Ghibli were also really careful to animate individual hairs on certain characters. Overall, this movie is a real treat for the eyes, and I very deeply regret not having seen this movie in theaters. The voice-actors also did their part. Hiiragi Yumi, who was 15 at the time of production, did a great job as Chihiro, though I thought it was Natsuki Mari who really stuck out from the cast as Yubaba. Also for those of you who have seen Departures, if the music seems familiar, that is because Spirited Away was also scored by Joe Hisaishi. Thanks to the voice-acting and the music, Spirited Away winds up sounding every bit as good as it looks. Despite saying Spirited Away is a children’s film, I would say this is also a great movie for adults as well. It is yet another one of those rare films that actually works well for the entire family. Much like the live-action film Departures, Spirited Away had moments that are laugh-out-loud funny as well as those that might draw tears out. Thus, much like how Departures is one of the best live-action films I have seen recently, Spirited Away is one of the best animated films I have seen recently, and gets a very strong 4 out of 4.